Pesach seder night was incredible fun that was mixed with a still feverish Tehilla and persistent coughing. We were up throughout the night with her coughing and when her fever returned in the morning, we started Tehilla on antibiotics. Within 24 hours, her fevers finally stopped and she overall looks less sick. Her coughing fits are still happening frequently. 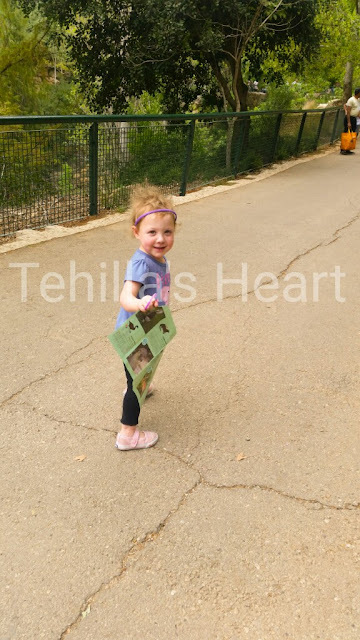 She was well enough this morning to go to one of her favorite places- the zoo! She had a great time and enjoyed every minute of it. She fell asleep on the way home and napped a very long time. It seems that Tehilla is on the mend with the antibiotics. Thank g-d.
Baruch HaShem!!!!!! To Him be the Glory!!!!!!!! !